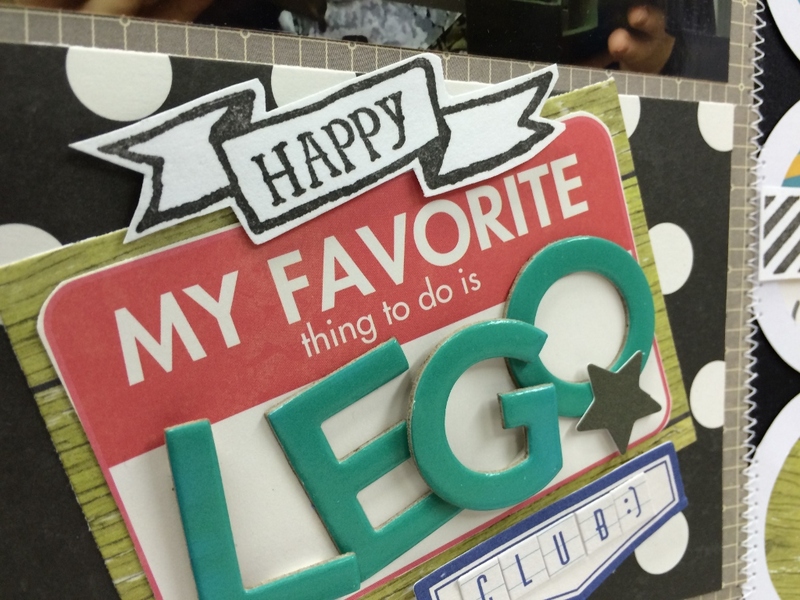 My son loves to head to our local Library for Lego Club once a month. So I wanted to capture one of these days for his album for him to look back on one day when he is older. I grabbed a brand new stamp set from Hampton Art and JIllibean Soup’s Saffron Yellow Pepper papers in all its fabulous colors. The black polka dot paper was the perfect base for the title cluster, next I added the green woodgrain layered behind the “My Favorite” bite size bit from that collection. Then I added the “LEGO” letters from the teal beanboard alphabet set as shown. 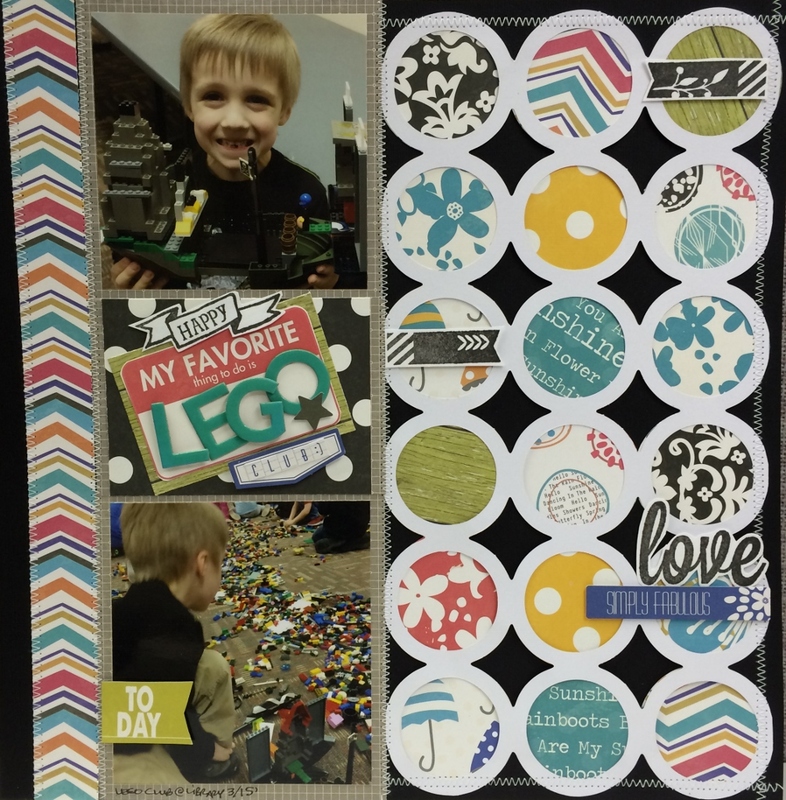 Then I stamped the “Happy” banner in black ink onto white cardstock and fussy cut it out and added with 3D foam dots. To finish the title cluster I added the gray star sticker and blue label sticker with added mini alpha “club”. Then to add in some texture I stitched in white thread the frame of the layout and the border strip and photos as shown. After that I cut out the Today banner from the bit size bits paper and added to the lower photo. 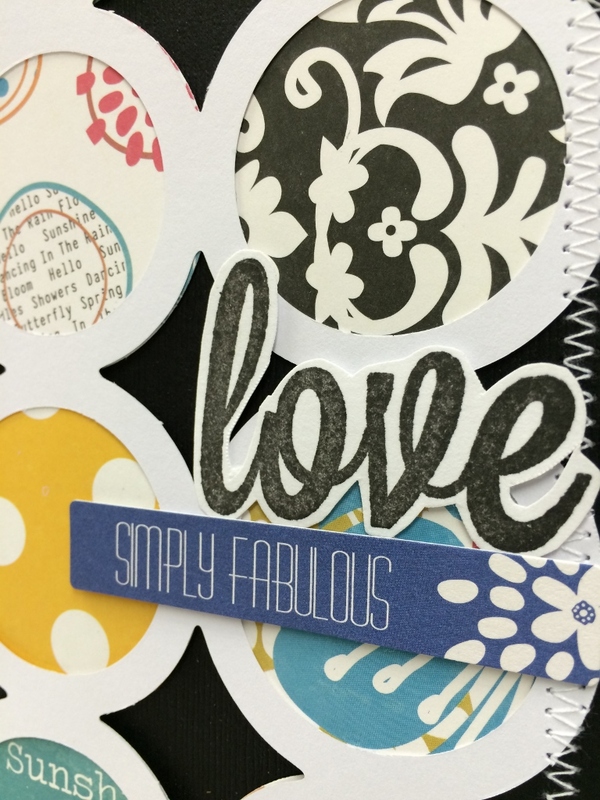 Then I dressed up the right side a bit with a few stamps from the same set, a couple banners and the “love” sentiment in black ink onto white cardstock. Then I added them with 3D foam dots to placemat as shown. Last I added the “Simply Fabulous” sticker from the Soup Labels sheet of Saffron Yellow Pepper Soup.